In the range of sheet metal coil feeding automation, Press Room has been redefining the industry standards & have brought out precision levellers for straightening of coils, strips, components, sheets. Why Press Room Levellers are your Profitable Decision. • Free test trials for your components at our test lab. 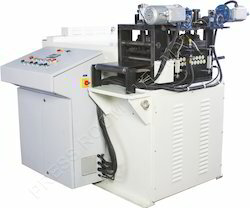 Single Component Leveller for flatenning of coils, strips, components or sheets. All Straightening rolls are Powered. Dial gauge roll position indicator..
Bolted rugged main frame in one torque resisting assembly. Main drive motor for 440 V, 3 ph, 50 cycle. “Run, Jog-Reverse, Stop” controls, Fusible disconnect..
Automatic central lubrication of work roll bearings. Depending on input component conditions, Raw material & hardness, roll setting, thickness variation of components. Straightening roll diameter from 8 mm to 200 mm to cover a wide range of jobs. Slant base for press coil feed operations. Variable speed drive and controls. Powered work roll positioning in place of manual. Remote work roll position indicators. Cascade rolls at entry or exit. Motorised adjustment of rolls with digital display. 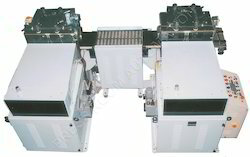 Twin Leveller consists of 2 precision levelling units connected by a turnable & it turns the parts by 90° beyween the two levelling sequences. Round parts are always levelled in two directions. 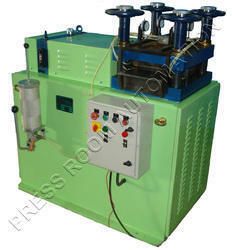 The most economical solution for series production such as clutch disks, Brake plates, etc. in a Twin Levelling machine. Automatic PLC Controlled Part Leveller is with following additional features which can be pre-programmed via PLC. 1. 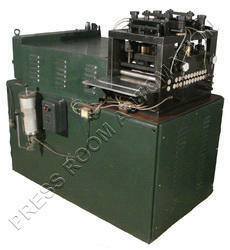 Adjustment of Straightening Rolls via Servo / A.C. Motor & Drive. 2. 10-30 Pats Setting Parameters can be Stored for Quick Retrieval in Future. 3. Accuracy of Roll Positioning in Range of 50 Microns. 4. Entire Operating Setting by Unskilled Operator, Once pre-programed. 5. Possibility of Two Three Program for Same Part due to variation of the Input Parameters like Hardness etc. Compoent Leveller are designed to correct any deviations in flatness caused by inner material tensions, which can occur during punching, laser or plasma cutting, hardening, nibbling, shearing and coating of steel, aluminium, copper, brass, bimetallic and special alloys. They are ideal for use in industries making building industry components, electro technical parts, mechanical and automotive components, perforated parts, drop wires as well as sawing and cutting tools. Component Leveller Roller head is designed with back up rolls in 4 HI or 6 HI configuration. All Leveller rollers are Powerd with integral universal geared drive through Cardon Shaft arrangement. Economical Leveller is used for levelling small components. Looking for Component Leveller ?